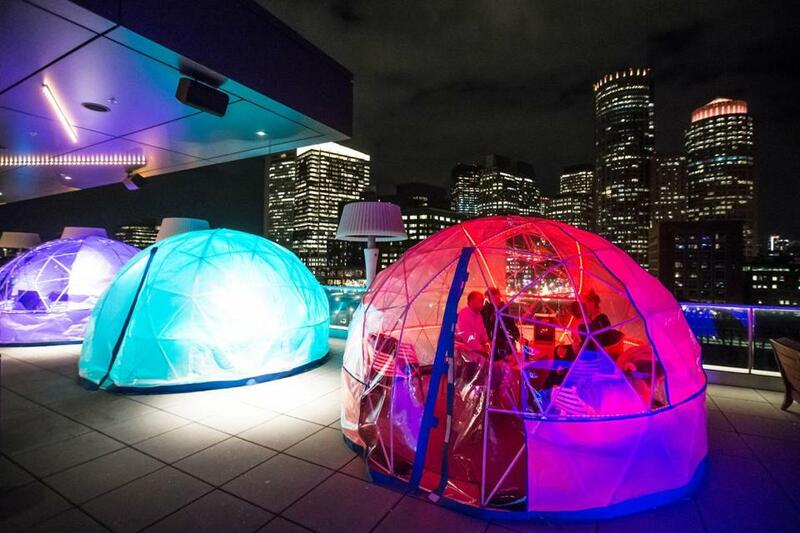 Temporary “igloos” are heated for guests at the Lookout Rooftop and Bar in Boston. If you want to get into the holiday spirit, sometimes a cocktail helps. A few Christmas and winter-themed pop-up bars have opened around town this season. Here’s a look at what they’re — temporarily — offering. Located in the Kimpton Marlowe Hotel lobby, Miracle Bar is a Christmas-themed pop-up bar decked out with lights, garlands, and specialty cocktails. 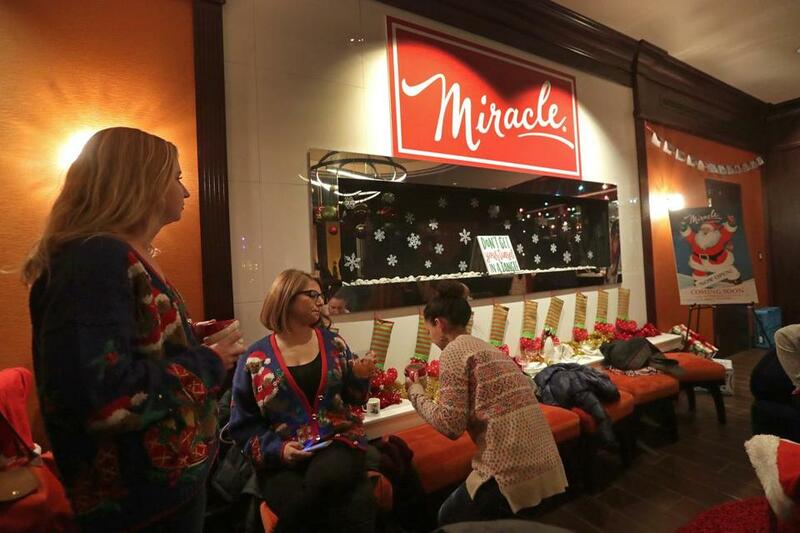 Located in the Kimpton Marlowe Hotel lobby, Miracle Bar is a Christmas-themed pop-up bar decked out with lights, garlands, and specialty cocktails. Even the bartenders wear ugly sweaters as a part of their uniform. The bar’s general manager, Amanda McBride, said she’s gotten fun feedback since the holiday theme was unveiled after Thanksgiving. ■ Bad Santa (served hot) — Mulled red wine, tawny port, orange liqueur, spices, golden raisins. Miracle will be open until Dec. 29. Each of the six heated igloos atop the Envoy Hotel in the Seaport seats 8-10 people, and are available on a first-come, first-served basis. 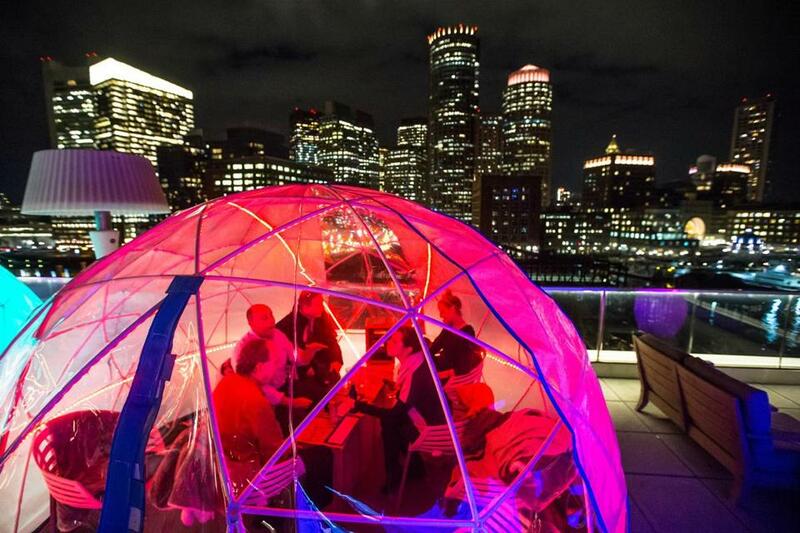 This pop-up “igloo” bar sits atop the Envoy Hotel in the Seaport. Each of the six heated igloos — constructed of plastic and festive neon lights — seats 8-10 people, and they’re available on a first-come, first-served basis. To order a drink, all you do is press a button that lights up the igloo, alerting cocktail staff to the request. Guests are also provided with fleece blankets to keep warm on especially chilly nights. The Envoy first set up the igloos in February and brought them back this November due to popular demand. Joe Mellia, the hotel’s general manager, said the igloos have been so successful this year that they’re considering adding three more. ■ Senior Mint — Vodka, mint liquor, salted caramel Kahlua, hot chocolate, and marshmallow. Hours: Wednesday through Saturday from 4 to 10 p.m. The igloos will be open until April 16, 2018. Craft brewer Trillium Brewing Co. opened a winter beer garden earlier this week in the Roslindale substation. 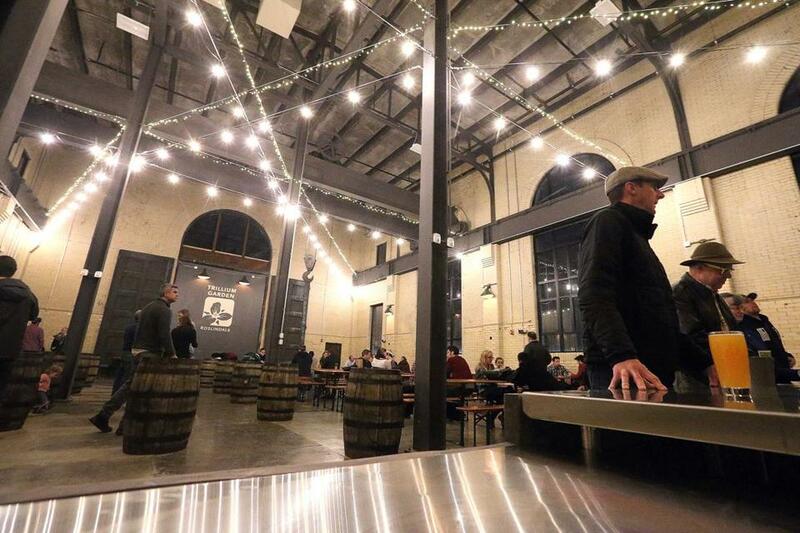 Craft brewer Trillium Brewing Co. opened a winter beer garden earlier this week in the Roslindale substation. This new location is an indoor counterpart to Trillium’s popular open-air beer garden on the Rose Fitzgerald Kennedy Greenway this summer. The summer Garden's tables, benches, and barrels have been repurposed for the new space. Trillium’s cofounder, Esther Tetreault, said Roslindale has been especially welcoming. “We hope that the Trillium Garden at the Substation will seamlessly integrate into the vibrant array of small businesses in Roslindale Village and become, for this winter, a gathering place for Roslindale residents while also attracting people from other parts of the city,” Tetreault said. On any given day, there are 8-10 rotating draft selections, all from Trillium Brewing. The beer garden sells beer for on-site consumption only, so they won’t have any cans or growler fills. The garden itself doesn’t sell food, but owners plan to invite local food vendors. Guests are also welcome to bring their own food or even order in from nearby restaurants. Hours: Wednesday through Friday 4 to 10 p.m., Saturday 11 a.m. to 10 p.m., Sunday noon to 6 p.m.
An exact closing date has not yet been announced, but Trillium says it plans for the winter beer garden to stay open through winter and into spring.